As people get older, the technicalities of sports get strict and the rules change from letting it slide to calling everything. There are basic rules that children need to learn before attempting to understand the higher level of play. 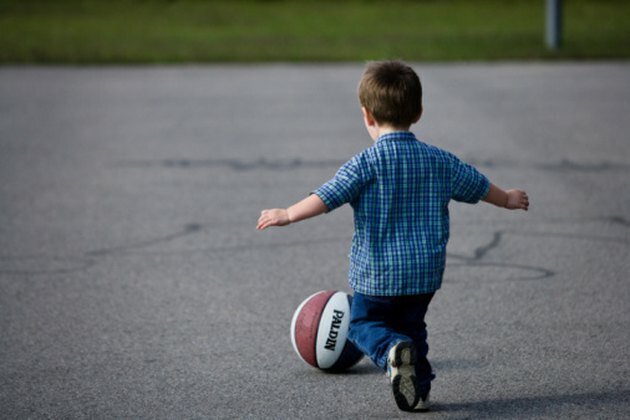 Knowing these rules will help you teach your child the fundamentals of basketball. All basketball courts are played on a huge rectangle. You or the ball are not allowed to touch outside the lines of the rectangle. This term is called out of bounds. The ball is thrown in from out of bounds, but once the ball is in play, it cannot return there. If you do not have the ball, you can step over the line without any penalties. In order to move with the ball, you must dribble it. A dribble is the term used when you bounce the ball and walk with it without picking it up or using both hands. If you use both hands or pick it up and dribble again, it is called double dribble and the other team gets the ball. A good dribble is achieved by keeping the hand on top of the ball. In order to score, the ball must go through the basket. There are three places a person can shoot from, for different points. If you are standing behind the three point line, which is the big arc around the basket, and make it in the basket, you earn three points. All other places in front of the arc are worth two points. The third place is from the free throw line. If you were fouled and you are shooting free throws, each free throw is worth one point. A foul is when you make contact with the person with the ball. If you are guarding someone with the ball, you are not allowed to touch or hit them. A foul can also be committed away from the ball. Shoving, hitting, tripping are all fouls also. None of these is allowed in basketball. If you are dribbling the ball, then you decide to pick the ball up, you are only allowed one step. The foot that you choose not to step with must remain on the floor. If you move the other foot, it is considered traveling, and that is illegal. Traveling results in the other team getting the ball. The only option you have once you pick up the ball is to pass it or pivot. Pivoting means, you can circle around and rotate your planted foot, but it cannot slide or come off the ground.